If you are in the market for a new mid-size sedan but feel overwhelmed by your options, perhaps you should start your car search with the 2016 Toyota Camry. As America's best-selling mid-size sedan, the Camry is beloved for its spaciousness and its lengthy list of standard convenience, technology, and safety features. After an all-new, redesigned Camry debuted for the 2015 model year, the Camry has returned for 2016 with improved interior features and better use of technology, including a vivid Multi-Information Display that now comes standard on all Camry models. Also new for 2016 is the Camry Special Edition model, which adds exclusive features like 18-inch Special Edition machined alloy wheels, standard Qi-compatible wireless smartphone charging, and unique interior with blue stitching. Drivers near Hollywood, Deerfield Beach, Weston, FL, and the surrounding communities can experience the incredibly spacious and well-appointed Camry at Lipton Toyota. 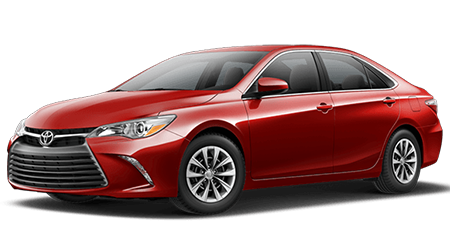 As an authorized Toyota new car dealership, we stock a huge inventory of new vehicles spanning the entire Toyota lineup, including the ever-popular Camry mid-size sedan. You can begin your car search here on our website by browsing our full inventory of Camry sedans and other Toyota vehicles. Then, plan a visit to our authorized Toyota dealership, where we will get you out on the road for a test drive! Our website is not only a great place to shop for a new Toyota, but also to research Toyota's latest models, like the 2016 Camry, and compare them to the competition. Continue reading below to see how the 2016 Toyota Camry mid-size sedan stacks up against the latest version of Nissan's mid-size sedan, the 2016 Altima. Whether you want to get into a new mid-size sedan at the lowest price possible, or you are shopping for a fully-loaded, V6-equipped model with every available option, the 2016 Toyota Camry will not disappoint. Toyota's popular mid-size sedan comes so well-equipped in standard base trim that it seems that anything above the base model is just icing on the cake! Standard amenities on the 2016 Camry include a 6.1-inch touchscreen display audio system, a rearview backup camera, and an 8-way power-adjustable driver's seat. Unfortunately for drivers who are shopping Nissans, none of the features come on the 2016 Altima base model. In order to get the large touchscreen, rearview camera, and power-adjustable front seats, you will have to add them as options or upgrade to a different Altima model. 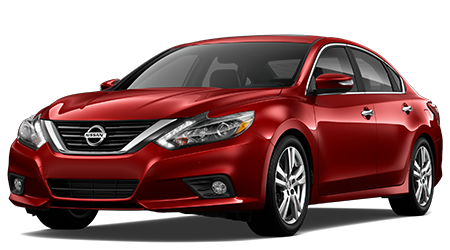 Either way, you will be paying a higher price for the Altima if you want one that is comparably equipped to the 2016 Camry base model. The Camry LE base model's Entune Multimedia Bundle is packed with high-tech goodies like hands-free phone capability, advanced voice recognition, phone book access, and music streaming, thanks to Bluetooth wireless technology. A powerful six-speaker audio system with an AM/FM radio with CD player and MP3/WMA playback capability, auxiliary audio jack, and USB 2.0 port is also standard on the Camry base model. If you expect the latest technology and convenience features as standard on a new mid-size sedan, then you may want to pass on the 2016 Altima, and get yourself into the Toyota Camry. When it comes to standard features, it is tough to beat a Toyota vehicle, and that certainly goes for the Camry. The latest Camry offers much more in addition to its technology and convenience amenities. Drivers -- especially parents -- will be thrilled to learn that passengers of the 2016 Toyota Camry are protected by ten airbags. In addition to its driver and front passenger Advanced Airbag System, driver and front passenger seat-mounted side airbags, rear seat-mounted side airbags, and front and rear side curtain airbags, the 2016 Camry is also equipped with knee airbags for the driver and front passenger. One of the most common types of injuries resulting from a front-end collision is knee injuries; that is precisely why Toyota has outfitted many of its latest models with standard knee airbags for both the driver and front passenger. Nissan does not currently provide front knee airbags on its Altima, nor does it have an answer to the Camry's Star Safety System suite of safety features, which are also standard on every new Camry. Six advanced safety features make up Toyota's Star Safety System, which provides drivers with additional control over their vehicles. Included in this suite of safety features are Smart Stop Technology (SST), Electronic Brake-force Distribution (EBD), Brake Assist (BA), Vehicle Stability Control (VSC), Traction Control (TRAC), and an Anti-lock Brake System (ABS). Toyota believes that you should never have to upgrade to get critical safety features, and it shows with its impressive list of standard safety features on the 2016 Camry. While you may not be able to test out all of the Camry's impressive safety features on your test drive at Lipton Toyota, you will surely be happy those features are there in the event that you ever need them! From its available Blind Spot Monitor (BSM) and Rear Cross-Traffic Alert (RCTA) to Dynamic Radar Cruise Control (DRCC) and Lane Departure Alert (LDA), Toyota offers an impressive list of advanced safety features on its Camry. The 2016 Camry's Rear Cross-Traffic Alert (RCTA) and Blind Spot Monitor (BSM) help keep the driver informed of surrounding vehicles that may be out of view, by sending the driver audible or visual alerts. Backing out of a parking space or into the street just got a lot safer, thanks to the Camry's Rear Cross-Traffic Alert (RCTA) and the standard rearview camera! The Camry's available Lane Departure Alert (LDA) system sends audible and visual alerts to the driver if the system detects an inadvertent lane departure. Underinflated tires are a serious safety hazard; that is why Toyota has equipped its new Camry with Direct Tire Pressure Monitor System (TPMS). Direct TPMS alerts the driver when a tire is underinflated, and you can even see which specific tire needs to be inflated by viewing the Camry's Multi-Information Display. Another feature that increases safety and convenience is Toyota's Dynamic Radar Cruise Control (DRCC): it allows the 2016 Camry to maintain a preset, safe following distance behind the vehicle in front, eliminating the need to start, stop, and adjust your cruise control. While Nissan offers some similar safety features on its 2016 Altima mid-size sedan, they will come at a price. Toyota's top of the line, V6-equipped Camry, the 2016 Camry XLE V6, starts at an MSRP of $32,205; a comparably equipped 2016 Nissan Altima 3.5SL is priced at over a thousand dollars more, or $33,525. For advanced safety features at a more affordable price, choose Toyota's 2016 Camry over the 2016 Nissan Altima. In the 2016 Toyota Camry, you will find that it not only has extremely comfortable seating, but it also provides more passenger space than the 2016 Nissan Altima. Thanks to its extra one cubic foot of passenger volume when compared to Nissan's Altima, passengers in the Camry have more room to stretch out and enjoy the ride. All five passengers will benefit from the Camry's greater passenger volume, as the Camry tops its rival from Nissan in all second-row dimensions, offering more rear legroom, headroom, hip room, and shoulder room. Front passengers also get more shoulder room and hip room in the Camry. If you care about the comfort of your passengers, why not drive the sedan with more interior space? Mid-size sedans may not be able to complete with SUVs or crossovers when it comes to cargo capacity, but they have become increasingly versatile cargo haulers over the years, thanks to their growing dimensions and available 60/40 split-folding rear seats. Case in point are the latest versions of the Camry and Altima: both of these mid-size sedans provide an impressive 15.4 cubic feet of cargo space inside their trunks. As both come standard with 60/40 split-folding rear seatbacks, cargo capacity and versatility increases when the rear passenger area is utilized as additional storage space. The pass-thru storage area that is exposed when the rear seatbacks are folded down allows transport of larger items easily. It is certainly now possible to transport large TVs, sports equipment, and supplies for your next home improvement project in these mid-size sedans. However, since the 2016 Camry provides a more spacious second-row of seating than the Altima, that extra level of spaciousness also means that maximum cargo capacity is also greater in the Camry. There are clearly so many great reasons to drive a 2016 Toyota Camry, so why not get behind the wheel of one explore the new Camry for yourself? If you live near the cities of Hollywood, Deerfield Beach, or Weston, FL, then you are never more than minutes away from Lipton Toyota's nearby showroom. Beyond the test drive, be sure to explore all of the Camry's convenience and technology features, along with its spacious and versatile cargo area. Stop by the Lipton Toyota showroom today; we are located at 1700 W Oakland Park Blvd, in Ft. Lauderdale, FL. You can reach our sales team by phone at (855) 908-4290.